I've witnessed plenty of mechanical dinosaurs in my day. Old trucks and cars left in my grandfather's field to rust and tractors that look like they should have been sent to the metal scrap yard years ago. But I can't say that I ever imagined them as "real" dinosaurs that once roamed the earth long, long ago. What would a bulldozer dinosaur look like? Author/Illustrator Chris Gall decided to show the world. 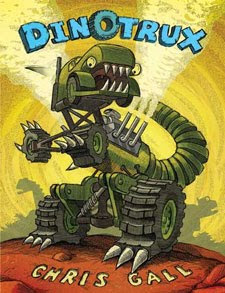 Roaring, loud, destructive mechanical dinosaurs fill the pages of his newest children's book, Dinotrux. Gall tells the story of the Dinotrux species from prehistoric times to present day. Oh yeah, they are all present in his book - the Dozeratops, the Craneosaurus, the Semisaur - in their menacing, fiery glory. The expressive text filled with noisy sounds is similar to the writing style in Kate and Jim McMullan's I'm Dirty! and I Stink! books. "RUMBLE! RUMBLE! RUMBLE!" and "HOOOOOOOOOONK!" The Dinotrux manners need refining; they shovel in the food, burp and perform other body functions right out in the open. A big, fold-out page in the back shows what happened to the prehistoric Dinotrux. Kids can compare prehistoric Dinotrux to modern versions by looking at the illustrations on the endpapers. Dinotrux has "boy" written all over it. My princess crazy daughter warily looked at the pictures out of the corner of her eye as I read the story to her. I'm not sure she knew exactly what to make of it, with the angry looking cavemen screaming and running away from massive, prehistoric mechanical monsters. But, since we just visited the Tyrannosaurus Rex skeleton at The Field Museum in Chicago, at least she seemed to enjoy the picture of a Dinotrux fossil on display. The napping pile of snoring Deliveradons (Delivery trucks) made me giggle. Can't get enough Dinotrux? A Dinotrux film is possibly in the works. Dreamworks Animation bought the screen rights to the book before it was even published. By the way, I'm quite certain the massive, destructive Dinotrux are not extinct. Here's a recent spotting of a certain Megasaurus species. Apparently, others have seen Robosaurus eating cars as well. Know any kids that like to watch Monster Trucks in action? The Dinotrux picture book would be perfect for them! This book looks like fun for young (boys) and for adults. I will have to check this one out - my 2 boys LOVE trucks and are just getting into dinosaurs. We were on a dinosaur hunt in the backyard just yesterday! My son just started sitting for books and he loves trucks! We will definitely be checking this out!